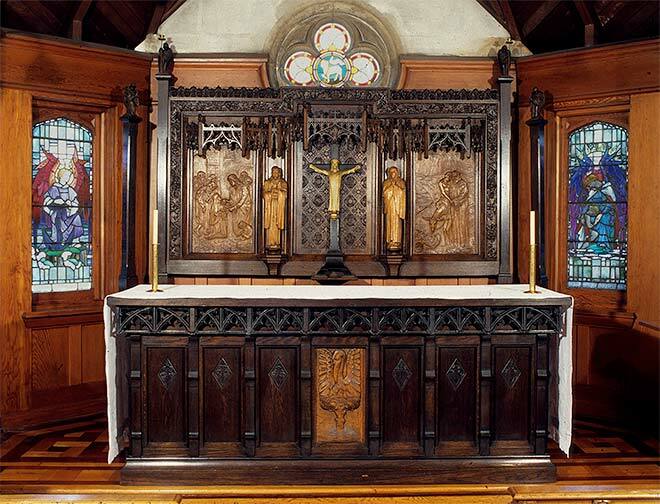 Frederick Gurnsey, New Zealand's foremost ecclesiastical carver in the first decades of the 20th century, produced a number of fine works including the oak altar and reredos in the Nurses' Memorial Chapel, Christchurch, carved in 1930–31. The altar features, in the centre front, a pelican. Believed to feed its young with blood from its breast, the bird was used to symbolise Christ and, by extension, refers to the compassion of the nursing profession. The reredos (decorative screen) behind the altar has bas reliefs showing scenes from biblical stories: Christ healing the sick and the Samaritan helping the wounded man on his donkey. Included in the carvings are both New Zealand and European plants, a feature of other works by Gurnsey.